The girl and I took a trip last week to NYC, first to visit my good friend Rebecca in Westchester, and then onto visit my sister in Brooklyn. I’ll talk about the Brooklyn half in the next post because this one gets a bit long. Stick with it though, for the incredible, never-before-heard, toddler travel tip that will guarantee a smooth journey with your small one. First, a few notes about the girl. This is a 2 year old who skipped naps, skipped meals, ate all sorts of sugary crap, had leaky diapers, was a stranger in a strange land, and through it all, was her usual smiling self. She is just remarkable. If I had subjected her brother at the same age to all these disruptions, he would have been an absolute disaster. No fun at all. With few exceptions, the girl was a pleasure to travel with and clearly loved the excitement of being somewhere new and making new friends. We got into town last Wednesday night and went to Rebecca’s very nice house in Westchester and played with her delightful kids for three days. Her daughter Sari, 51/2, is a real take-charge type (just like her mom) and made sure that the girl was well attended to. At one point, my girl was outfitted with a baby-filled stroller, toy cell phone, purse, and play shoes. Sari took one look at her and said, “You’re the mommy now, so you need a camera. Here–let me get you one” and promptly plopped a camera around her neck, to my little one’s delight. This is the best picture I got of her, so you can’t properly see how adorable Sari is. 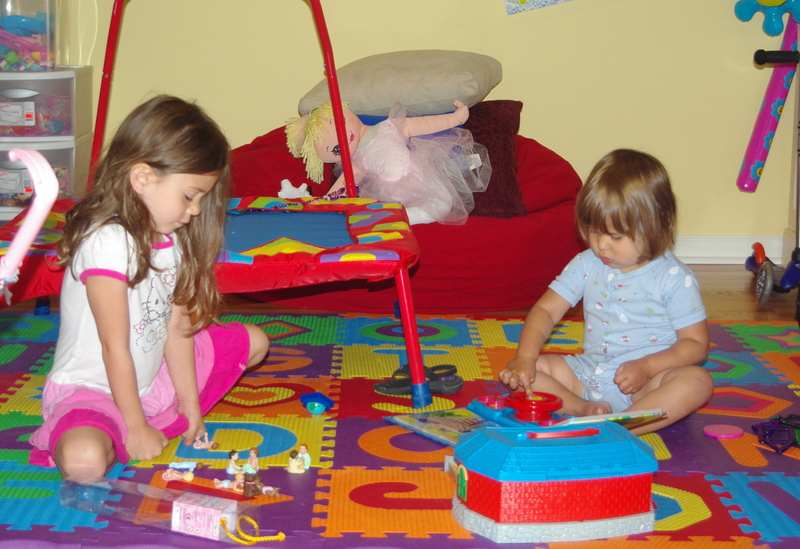 You can, however, see Rebecca’s playroom, complete with trampoline (! ), that my girl went gaga over. The next day we went to the Children’s Museum in Norwalk, Connecticut. 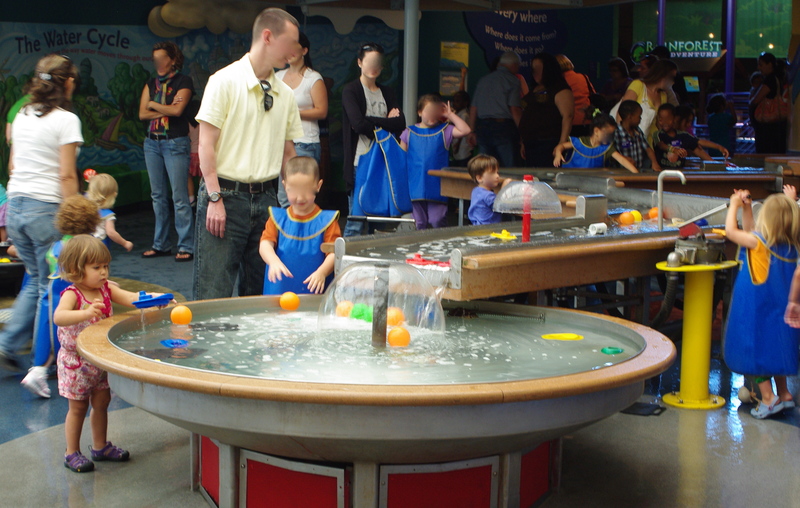 It’s a fabulous kids museum with a lot to do for the toddler set, which is a nice change since so many Children’s museums are often more geared to the 5-9 year old set, with the exception of a fomite-filled infant/toddler play area, from which your child is sure to bring home some novel germ and infect the entire family. Of course, as luck would have it, 3 big school groups showed up at the same time we did and the place was insane. The kids didn’t seem to mind at all, but it was maddening for Rebecca and I. There was a great water play area. My child is the one who refused to wear the protective apron. See if you can spot her. Sorry for the blurred out faces–it’s a little creepy, I know. You know what I always think, though, is “What if someone is in the Witness Protection Program?” Then I go and post their picture on my little site with identifying local information and the mafia tracks them down and kills them. I couldn’t live with myself. The outdoor play area is awesome. 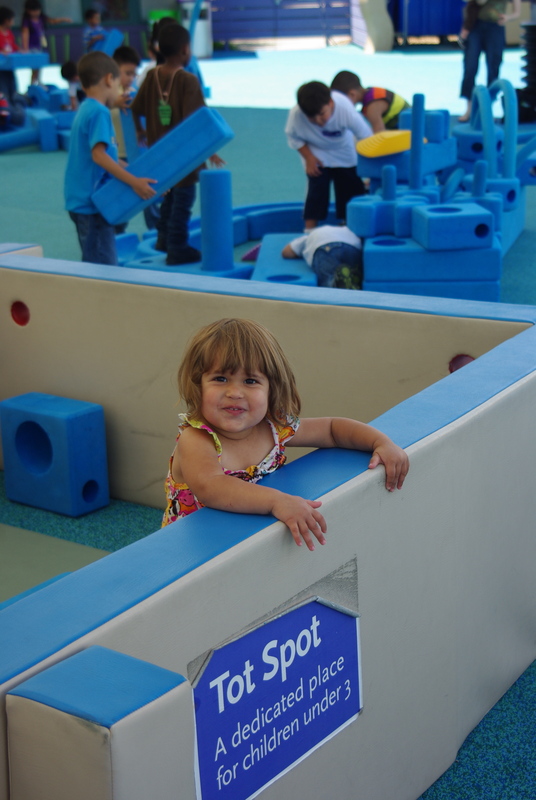 It’s a big area filled with giant blocks, noodles, and walls that can all be built together to make a DIY play structure. See the older kids making the incredible sculpture in the background? Those were the some school group members I had to mildly chastise for trying to run our children over in the “Tot Spot.” When they all came out for lunch onto the playground, it felt like the Running of the Bulls had been let onto a field of baby bunnies. Rebecca and I saw the doors open, and as if in slow motion, we saw the 8 year olds exploding out the doors. We jumped and swept our baby bunnies into our arms, seconds away from being trampled on by size 6 sneakers. After the bulls had been appropriately shooed away from the bunny field, our kids went back to playing peacefully. On a side note, you may also notice that my daughter has undergone a wardrobe change from the water play area. You figure it out. Here’s Rebecca’s son, Donny, having a ball. He would keep bringing in more and more foam blocks into the little fortress with the girl, and she would get increasingly disgruntled about it and promptly pick them up and throw them out as fast as she could. It became very comical. For me, it was just so nice to be around an old friend. Bec and I have an easy time together and it was so relaxing to be with someone that I feel totally comfortable around. I find that as I get older, it gets harder and harder to make that same sort of friend. I think a lot of it has to do with the fact that Rebecca and I spent hours and hours together in medical school since we lived together, and also went through that difficult time together, which bonds you to someone. Now with the kids, I just don’t have that same amount of free time or the ability to just sit on the couch for hours with a girlfriend watching dumb TV shows and talking about nothing. Are you ready for the never-before-heard toddler travel tip? It’ll change your life, I swear. 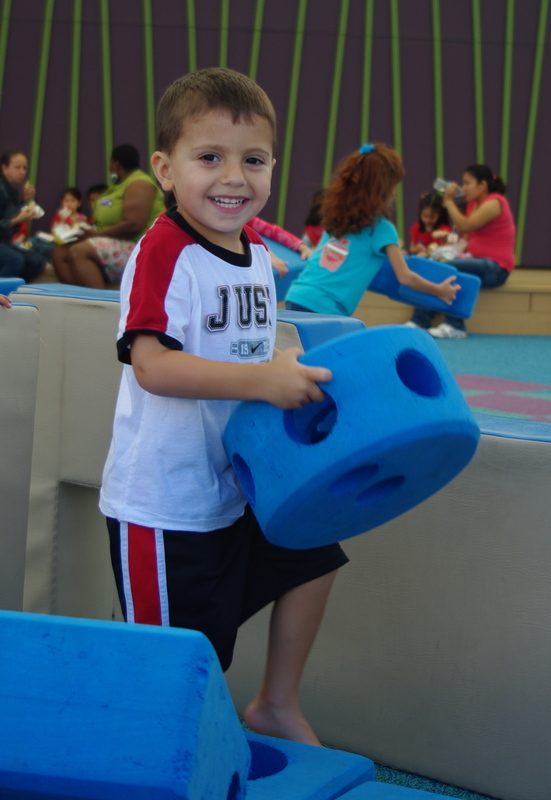 If you want to have easy travel with a small child, the trick is to…. Give birth to an easy child. That’s it. Just make sure that when you conceive, you are creating a future non-fussy, loves-to-sleep-and-eat, basically happy creature and you too can have many future enjoyable journeys. You heard it here first. Stay tuned for the Brooklyn half of the ex-po-tition!